Maintain Clean, Safe Air Quality in Your Industrial or Commercial Workshop with this Amazing 1100 CFM Portable Source Capture Chemical Fume and Odor Extractor System! 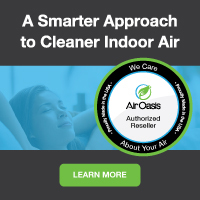 Removes a Variety of Chemicals, VOC's, Solvent Fumes, Gas or Diesel Fuel Smells and More from Manufacturing, Auto Parts Cleaning, Laboratory Processes & More. Great for Flammable or Explosive Fume Removal, Too, 100% Made in USA--All at A Discount Price with Free Regular Ground Shipping! Best For: Chemical Fume, VOC's and Odor Removal in Commercial Workshops, Manufacturing, Laboratories, More. Motor Out of Airflow-Suitable for Flammable or Explosive Fumes, Fuel Odors, Solvents, etc. Custom Carbon Blends for Specific Chemical Removal Available. Harmful toxic chemical fumes, odors and gases are a common problem in a variety of manufacturing operations. Many of the vapor and fumes are also explosive, which requires expensive explosion proof fume extraction systems. The AER Control Systems’ Portable Fume Extractor System with Arm is an affordable, effective tool that solves all of these fume pollutant issues. 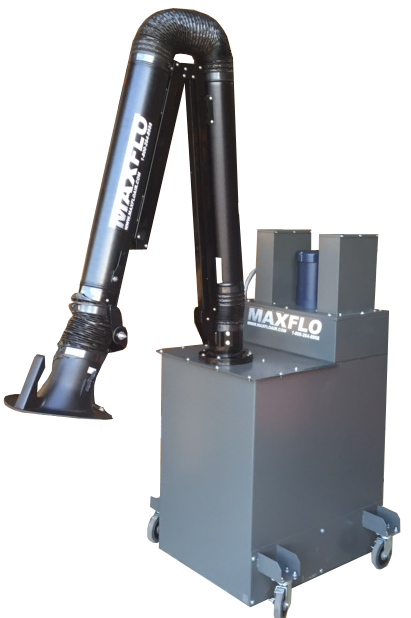 This portable fume and dust collection system not only provides strong 1100 CFM airflow for effective removal of chemicals, fumes and odors at the source, the motor is out of the airflow, removing the main source of ignition / sparks from the pollutant, thereby creating a natural resistance to explosions, fires, etc--at a fraction of the cost of typical explosion-proof fume extractors. The AER Portable Fume Extractor System is designed to use disposable particle filters along with the carbon to reduce the cost of the unit, to protect the carbon, and to provide a more sanitary environment, should any microbes be suspected or trapped in the filter. The Portable Fume Extractor with Arm will also assist you regarding compliance with OSHA and local air quality regulations by drawing chemical and VOC contaminants (as well as dust) away from the operator’s breathing zone and reducing VOC concentrations to safe and acceptable levels (within PEL's). The Portable Fume Extractor with Arm comes standard with powerful 4 stage filtration: a first stage throw-­‐away ring polyester filter, a second stage 95% efficient ASHRAE Fiberglass Box filter MERV 14, following by two refillable 56 lb activated carbon trays that trap 80% of most chemicals and VOC's on the first pass, moving to 100% removal with subsequent passes through the filters. Also standard is a single phase 1.5 HP TEFC motor with a non-­‐overloading direct drive blower, and a tool-­less filter access door. Unit comes standard with on / off controls, however, a variable speed module can be added to fine tune airflow between 500 and 1200 CFM. At our online store, we make it easy for you to get the best commercial and industrial fume extractors at discount prices with free shipping due to our extremely low overhead. Call our specialists today at 1-800-701-2513 to discuss the specific filter configuration that will perfectly suit your application. We are here to help! Add VFD Variable Speed Module? Add Replacement Carbon Trays--56 lb EA? Add Replacement Carbon Only, No Tray--112 lbs?